Featured Four questions for Calvinists. Discussion in 'Calvinism & Arminianism Debate' started by glad4mercy, Oct 27, 2016. Can a person be regenerated before receiving the Holy Spirit? How can a person receive regeneration unconditionally, when receiving the Holy Spirit is conditioned on the HEARING OF FAITH? So you have receiving the Holy Spirit necessary to regeneration, and you have the hearing of faith necessary to receiving the Holy Spirit, Therefore, the hearing of faith is necessary in regeneration. And again, this is not synergism, folks. 5. Trick question - we don't "receive regeneration". How'd I do (is there an answer key to check our work)? I understand what you are saying re number 5. I think you are understanding the word "receive" differently than the way I used it. (I did not mean to be ambiguous.) Would you still answer 5 the same way if I told you I meant the word "receive" as in "it is given to us by God" and not in the purely active sense? But according to your answers to 1-4, a person must have faith to be regenerated, not that a person must be regenerated to have faith, as some Calvinists claim. Regeneration occurs when we are receive the Spirit, and we receive the Spirit by faith. Therefore we are NOT regenerated by God in order to believe but because we have been given the gift of faith. I am probably not the best for a lively debate here. When it comes to God drawing men, I think that this can be a process (like Spurgeon, I believe that God is a God of means, and the most common is persuasion). But when it comes to actual salvation, I believe it is one act of God. We look at this one act in different aspects, but I disagree that they can be broken down into stand alone micro-doctrines. I believe that a regenerated man has faith, one who has this kind of faith is a regenerated man. I do not believe that there exists a microsecond where one is regenerated but does not believe, but I also don't believe a man believes apart from being regenerated. It is like asking if "repent and believe" means you turn from your sin and then turn to God, or if you turn to God and then turn from your sin. It is different aspects of the same thing. I disagree. While I agree there is no regeneration without faith, I do not believe there can be a person who believed without also being a new creation in Christ Jesus. You have, I belueve, shown the necessity of faith. But can you show an instance in Scripture where someone who believes unto salvation but is not saved? I don't believe you can, and the reason is these are interdependent aspects of salvation, of God's grace. You are risking the same error that you oppose, only with a different aspect of the same "thing." They are both descriptive of salvation. Yes, they all go together. No regeneration = no faith, no Spirit. No Spirit = no regeneration, no faith. No faith = no regeneration, no Spirit. At no time is one absent, they are interdependent, so to speak. "Can the cross save a sinner BEFORE they hear the Gospel?" The Good Thief. Paul himself. Both saved before they heard the Gospel. "Can a person be Christ's without the Holy Spirit? What is the God appointed means for a person receive the Holy Spirit?" Without the holy spirit....you can ask for it from the FATHER even. N NE HERE believes in monergism. Debating it is self-refuting. If for a minute I was monergist, I would not whine and complain with the opposition since we lack the capacity to correct them. The logical step rather then whine about why anyone would disagree would be to appeal to God to do his part. Same goes for "reprobates" I would not waste 5 minutes on you, Dear lord....fix this guy. And that's it. Scripture is synergism, People wrote scripture inspired by God. That's why its the gospel according to Matthew rather then Gospel 1 according to God. Even on basic level of language it is synergism. Try reading a Chinese bible without knowing Chinese. Believe me you will have to cooperate with the Chinese language. All these issues stem from a FALSE HUMILITY. Trying to one-up everyone else's credit to God for all. I can count to 5. No only God can count to 5. Its through God's grace and by his predetermined will that he has counted to 5. It is by God's grace that even 5 is 5. The problem also is it preaches God the limited. God is too dumb to make anything smart. God can do anything right......except make anything do anything right. According to Galatians 3:2, how did you receive the Holy Spirit? 2. Repenting and believing are not regeneration. Here is the best definition of regeneration (outside the Bible) I have found. 4. Calvinists confuse the drawing of God with regeneration. By "hearing with faith"...i.e., by "the power of God" (1 Cor 1:23-24). 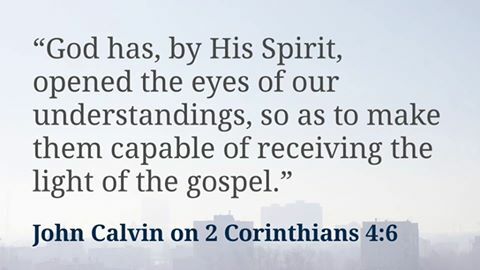 I am not denying that we receive the Spirit through the Gospel. I am saying that, while we can examine these doctrines alone in terms of "cause and effect", it is an error to view them in salvation as a process. They are interdependent. We cannot believe without the work of the Spirit, we cannot be renewed apart from the washing of regeneration (Titus 3:5). In Ezekiel 36, God says to Israel that he will forgive them, He will take out their old heart and give them a new one, He will give them a new spirit, He will put His Spirit in them, and cause them to walk in His statutes and they will obey His commands. I believe that this is speaking to the salvation of men. Some will insist God is speaking only of Israel in this passage, which is fine too because God is an immutable God and if this is how God will work with Israel then this is how God works with men. It is entirely a work of God at the most fundamental level. This is not exclusive of human belief, obedience, acceptance, etc. But this is ONE act of God, not individual and distinct acts that culminate in the main event of salvation. Think of three gears – redemptive faith, regeneration, and the dwelling of the Spirit. These three are positioned as a triangle (one on top and two on bottom). As the first turns, it turns the second, which turns the third, which turns the first. They are interdependent. So sure, faith produces redemption which produces faith, all the work of the Spirit. There are Calvinists who will pull out regeneration, examine the micro-doctrine, and then make conclusions without putting it back in its place of salvation. You are pulling out redemptive faith, looking at the micro-doctrine, and doing exactly the same thing by forming conclusions without putting it in its rightful place. Sometimes we can stand together in awe at the whole while misunderstanding how the individual components work together “under the hood”. When it comes to redemptive faith, the work of the Spirit, and regeneration I believe that people are wrong to insist on salvation as a process. It is a singular work of God – born again, born of water and spirit, born from above – not a process itself. God cleanses, gives a new heart and spirit, put’s His Spirit in us, causes us to walk in His statutes, and we obey (one act, not several building to the next ‘event’). quote- By "hearing with faith"...i.e., by "the power of God"
Of course, I believe salvation is by the power of God and faith is the gift of God. But isn't faith the act of believing the Gospel from the heart? And John 3:16 is not talking about God when it says "whosoever believeth". I think people get caught up thinking that we believe that faith is something that comes from our own making. Not at all. It is the gift of God, BUT IT MUST BE EXERCISED. God is the effectual cause of it all. I do not deny this. quote- it is an error to view them in salvation as a process. REGENERATION is not a process. Justification is not a process. They are instantaneous. quote- We cannot believe without the work of the Spirit, we cannot be renewed apart from the washing of regeneration (Titus 3:5). Sorry, don't have time to respond to all right now. I will get back to you later. I'm not sure if this is a point of disagreement, but while we agree regeneration and justification are instantaneous and not a "process", I'm not so sure that we are viewing salvation as a whole as an instantaneous work (I don't want us to talk past each other here). I believe that God draws men to Himself. This, I believe, may be over an extended period (I suppose this could be defined as a "process"). The ground is prepared, the seed sown. Holy Spirit God works towards a faith yet present. But I do believe that there comes a point where men are "saved" in the present, where they are "in Christ" and assured of a future salvation. And I do not believe that this point, this "conversion", can itself be viewed as a process. God drew me, He worked in my own will in such a way as to incline me towards Himself. I do not believe that this is regeneration (not the "regeneration" of Scripture, anyway, that "washing of regeneration" of which Paul spoke). The moment I believed, when I accepted Christ, was the moment that I also experienced the washing of regeneration and the renewing of the Holy Spirit. God drew me, but those aspects or "elements" of salvation were not processes to but components of salvation. I think that we agree on much, and I certainly would not shy away from the honor of worshiping with you as my brother. But I think that we lose something when we try to make salvation a process. quote- I'm not sure if this is a point of disagreement, but while we agree regeneration and justification are instantaneous and not a "process", I'm not so sure that we are viewing salvation as a whole as an instantaneous work (I don't want us to talk past each other here). Would you consider "practical sanctification" and "final glorification" (including BODILY RESURRECTION) aspects of God's work of salvation? quote- I believe that God draws men to Himself. Amen and Hallelujah. I would never have come to God if He had not drawn me. Neither would anyone else. quote- This, I believe, may be over an extended period (I suppose this could be defined as a "process"). NOT ALWAYS, (unless you are referring to natural revelation). quote- But I do believe that there comes a point where men are "saved" in the present, where they are "in Christ" and assured of a future salvation. quote- And I do not believe that this point, this "conversion", can itself be viewed as a process. Do you distinguish between conversion and regeneration? I already said regeneration is not a process. Neither is conversion. You are either converted or not converted. There is no middle point where you are partially converted, only PERHAPS in the process of being drawn. Quote- God drew me, He worked in my own will in such a way as to incline me towards Himself. Quote- I do not believe that this is regeneration (not the "regeneration" of Scripture, anyway, that "washing of regeneration" of which Paul spoke). BANG!!!! You nailed it!!! Being drawn is not the same as being regenerated!! But it seems that SOME Calvinists confuse the two. BEING DRAWN is not the same as BEING CONVERTED OR BEING REGENERATED. You just hit the very crux issue that seperates what I believe from Calvinism. a. You cannot be regenerated without receiving the Holy Spirit. c. therefore, you cannot be regenerated apart from faith. Does this not then make faith necessary to conversion and regeneration. So then faith is not the result of regeneration, either they are similtaneous or faith precedes. If they are similtaneous, then it cannot be said that faith is a RESULT OF REGENERATION, as I have heard some Calvinists say. Quote- The moment I believed, when I accepted Christ, was the moment that I also experienced the washing of regeneration and the renewing of the Holy Spirit. God drew me, but those aspects or "elements" of salvation were not processes to but components of salvation. Quote- I think that we agree on much, and I certainly would not shy away from the honor of worshiping with you as my brother. But I think that we lose something when we try to make salvation a process. People divide and create schisms over THEOLOGICAL SYSTEMS. But when you examine the schisms, it is largely due to misunderstandings between the two systems. 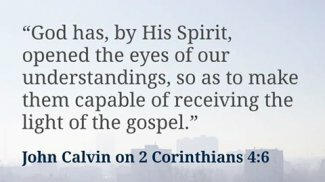 Calvinists are grossly misrepresented by Arminians in many cases, and the reverse is true also. I am not here to argue or divide. I am here to foster understanding and to try to remove some of the misconceptions that are causing division in the body. Arminians are NOT synergists, for we do not believe that we regenerate ourselves (either wholly or in part, no matter how small or minute), nor do we believe that God needs our help in saving us. Please read my final post in "Misunderstanding Limited Atonement" if you get a chance. quote- Think of three gears – redemptive faith, regeneration, and the dwelling of the Spirit. These three are positioned as a triangle (one on top and two on bottom). As the first turns, it turns the second, which turns the third, which turns the first. They are interdependent. So sure, faith produces redemption which produces faith, all the work of the Spirit. a. The drawing of God produces faith in those who believe. b. Faith results in the indwelling of the Spirit. c. The indwelling of the Spirit results in regeneration. (note: It can be said that the indwelling of the Spirit is indwelling, but I worded it this way because I am describing both the Divine act of regeneration AND it's results on the believer. Quote- There are Calvinists who will pull out regeneration, examine the micro-doctrine, and then make conclusions without putting it back in its place of salvation. You are pulling out redemptive faith, looking at the micro-doctrine, and doing exactly the same thing by forming conclusions without putting it in its rightful place. Not at all, I am agreeing with the Bible when it says that we receive the Holy Spirit by means of the hearing of faith, whereas others say we receive faith by means of receiving the Holy Spirit. Not so much a temporal order, rather it is a logical order. Because the two events are basically similtaneous. quote- When it comes to redemptive faith, the work of the Spirit, and regeneration I believe that people are wrong to insist on salvation as a process. It is a singular work of God – born again, born of water and spirit, born from above – not a process itself. God cleanses, gives a new heart and spirit, put’s His Spirit in us, causes us to walk in His statutes, and we obey (one act, not several building to the next ‘event’). I do not see any disagreement between us at all. What I see is that you are a person who is willing to listen and reason instead of argue. There are a few here that are like that, but not all. But is that regeneration or illumination, which is part of God's act of drawing, right? Regeneration is being raised from Spiritual death by the permanent indwelling of the Holy Spirit, not mere illumination. Thanks for the comments and I agree that my analogy (as all analogies are) has weaknesses. My illustration addresses the very narrow point of conversion at the exclusion of the “drawing” of the Spirit, sanctification, and glorification. And you are correct that my denial of “salvation” as a process is wrong. I was thinking “conversion” and fully agree with you in terms of sanctification and glorification. What I mean is conversion is not a process (this is, in my view, excluding the drawing of the Spirit as I do not think this is the same as being “indwelt”). Thank you for the correction. I agree and disagree. The drawing of God does indeed produce faith in those who believe, we received the Spirit by the hearing of faith, and we are renewed by the work of the Spirit (we are washed by regeneration, renewed by the work of the Spirit…I am not confident that these are two entirely separate events). But I think we may disagree in the negative. What I mean is that I do not believe that one can have faith without being indwelt by the Spirit, nor does the Spirit dwell within one who is not regenerated. I appreciate looking at these things individually, but I really do not think that it is an “A leads to B” type of progression or process. If I am wrong, it certainly will not be the first time, but until that realization dawns on me (and I am pretty thick headed) I’m going to hold fast to what I do believe. To answer your question, I do distinguish between “conversion” and “regeneration”. I view conversion as the act of God saving a man (for the believer, salvation “past”…so to speak). But I’ve viewed “regeneration” as more being made anew. I don’t know why, and reading Titus 3 this may indeed be incorrect (“washing of regeneration and renewed by the work of the Spirit”). But I think of “conversion” as both positional and ontological while I’ve considered “regeneration” as ontological (being made a new creation). I do not view regeneration as enabling men to come to God or God drawing men. I think Paul is clear that this is a "washing", a cleansing. And I believe Paul to be equating this to the renewing work of the Spirit. But yes, I know some Calvinists hold that regeneration is being made alive so that one can come to faith (which looks very much to me like a saved lost person). I will read your comments on the other thread soon. We just returned from a funeral and I don’t have the mind for it at the moment (which I will also use for an excuse if anything I’ve said thus far has been nonsensical ). But I look forward to reading it. Sorry about your loss, brother. I will pray for you and yours.